Three people were shot at an apartment complex near Legoland California just before sunrise Saturday morning. Photo via OnScene.TV. Three people were shot at an apartment complex near Legoland California just before sunrise Saturday morning. It happened about 5:50 a.m., when Carlsbad police received multiple reports of shots being fired at an apartment complex in the 5500 block of Whitman Way — just east of the intersection of Cannon Drive and Faraday Avenue, and less than a mile from Legoland. 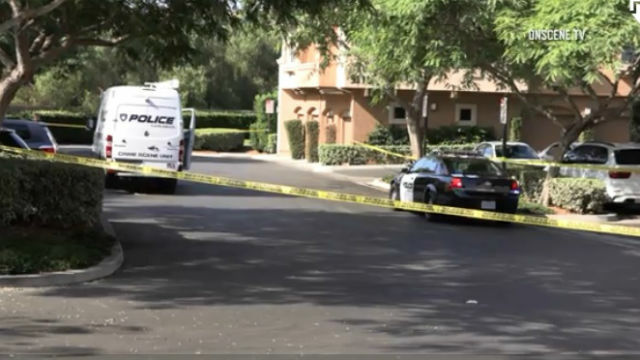 Officers found a man and a woman, each with “a serious gunshot wound,” in a courtyard area inside the complex, Carlsbad Police spokeswoman Jodee Reyes said. They were also able to find a suspect in the apartment complex, a man who was suffering from what was described as a non-life- threatening gunshot wound. The two victims and the suspect were all taken to a hospital for treatment. No further information on their conditions was released. Detectives were trying to piece together how the shooting occurred, but they believe the three knew each other and the shooting was not random, Reyes said. They don’t believe there are any outstanding suspects. A portion of the apartment complex continued to be closed off Saturday morning while detectives conducted their investigation.